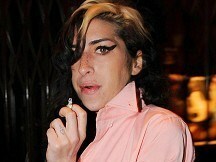 News - Winehouse biopic in the works? Winehouse biopic in the works? Amy Winehouse's life story is to be brought to live in a TV bio series, it has been reported. The troubled star - who topped the charts and wowed with her unusual voice but also battled drug and alcohol addiction - was found dead at the age of 27 at her Camden home last month. Her family have been contacted by TV stations about telling her story on screen, according to The Sun, and want to make sure they find the right actress to play her. A source told the newspaper: "The feeling is there wouldn't be an actress under 30 who wouldn't want to play her. "The first job is to get financial backing from co-production companies in the States. Some are showing interest because it's a sure-fire money-spinner. "They know anything Amy-related is going to be a huge success." Amy's father Mitch Winehouse is setting up a foundation in her name to help a range of causes close to the singer's heart. Mitch said: "This could include help for children in trouble, suffering from health problems, children's hospices and more. "While it is separate from my campaign to find more help for young addicts, that may be one of the areas the foundation contributes to." Wretch 32 may not have released his debut album Black And White yet, but he's already flying high with a record six nominations at the Urban Music Awards. The Game could face charges after a tweet from his account incited a telephone flash mob that overwhelmed the emergency phone system at a police station. Tulisa Contostavlos could be joining Olly Murs on stage at V Festival, the Xtra Factor presenter has let slip.